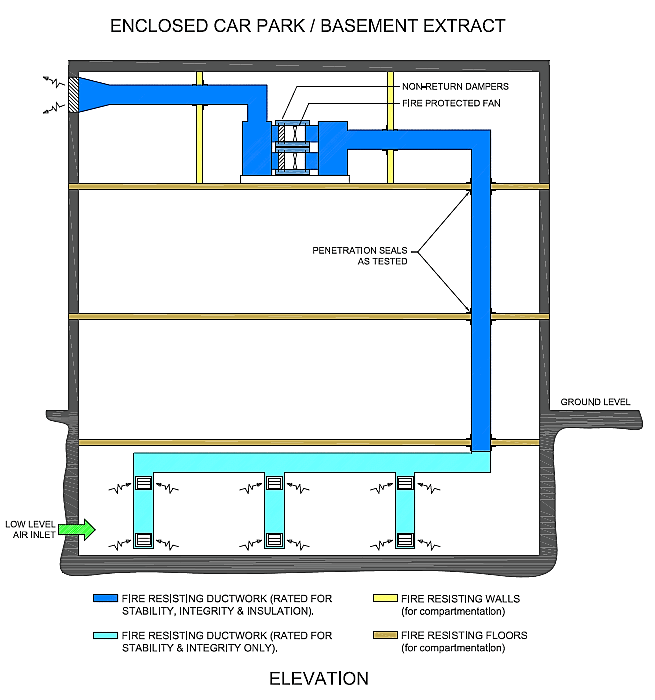 An enclosed car park or basement area requires an extract ductwork system suitable for clearing smoke and fumes. This is a situation where fire resisting ductwork is a perfect solution in lieu of standard ductwork with fire dampers. Mechanical ventilation must provide 6 ACH (Air Changes per Hour) under normal conditions. In the event of fire this rises to 10 ACH. Extract points must be arranged so that at least 50% are at high level. All components of the system must have a minimum melting point of 800°C. Approved Document B : Fire Safety B3. According to BS 9999, fire dampers should not be used in any basement or enclosed car park extract system. The ability of ductwork to retain a high percentage of its cross-sectional area in the event of fire is critical. This percentage varies between 75% and 90% – depending on which test standard is referenced – and applies equally to ductwork in the fire compartment and adjacent compartments.